One of the key ways of controlling your horse’s bend is using your outside leg. 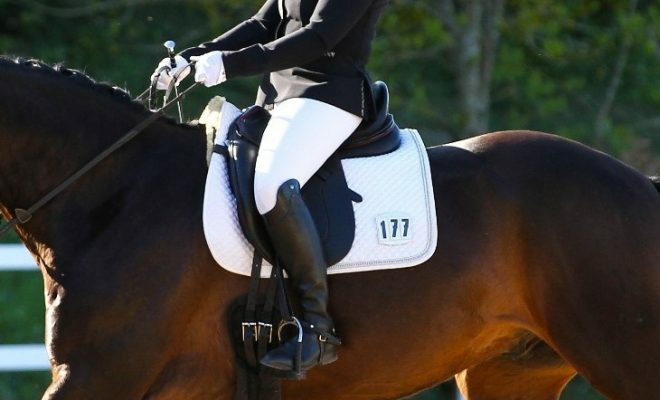 However, how to use your outside leg is one thing that many riders who are at the beginning of their dressage career get wrong. In this article, we discuss how to use your outside leg correctly and when to use it. What’s your outside leg used for? Your outside leg, when used correctly, helps to control the horse’s bend and the position of his hindquarters. Positioning your outside leg is one of the hardest things to do. That’s because you need to have your outside leg back while your outside shoulder is forward. It’s rather like trying to pat your head and rubbing your tummy at the same time; your body insists on doing the opposite to what you want it to do! Consequently, when instructed to put their outside leg back, riders usually swing the leg back from the knee. When you do this, the position of your seat bones in the saddle does not change. Instead, you need to move your knee away from the saddle to allow your leg to come back from your hip. 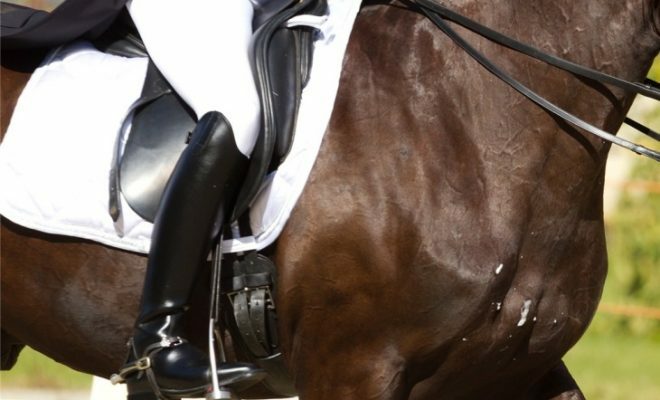 You can check that you’ve got it right by looking at the knee block on the front of your dressage saddle. Your leg should clearly come away from the block. 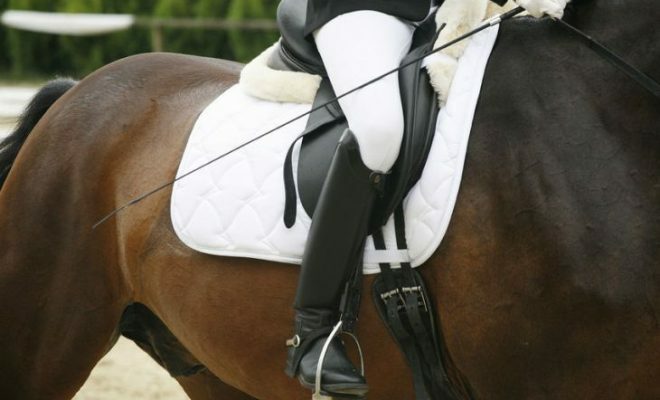 Keep your hips square in the saddle so that you don’t twist. When you have your outside leg back correctly, more weight will automatically shift to your inside seat bone. So, there are two basic positions in which you will use your outside leg. When the horse is moving straight, both legs should be at the girth or slightly behind it. When the horse is bending, your outside leg is back from your hip, while your outside shoulder comes forward. Your outside leg is there to support your outside rein. The outside rein controls the horse’s shoulders and forehand, and your outside leg controls the horse’s hindquarters. Remember that your outside leg aid will only be fully effective if you open out your hip to allow the weight to come more into your inside seat bone. When do you use your outside leg? When riding a circle or a corner or turn, the inside leg asks the horse to bend his body around it. 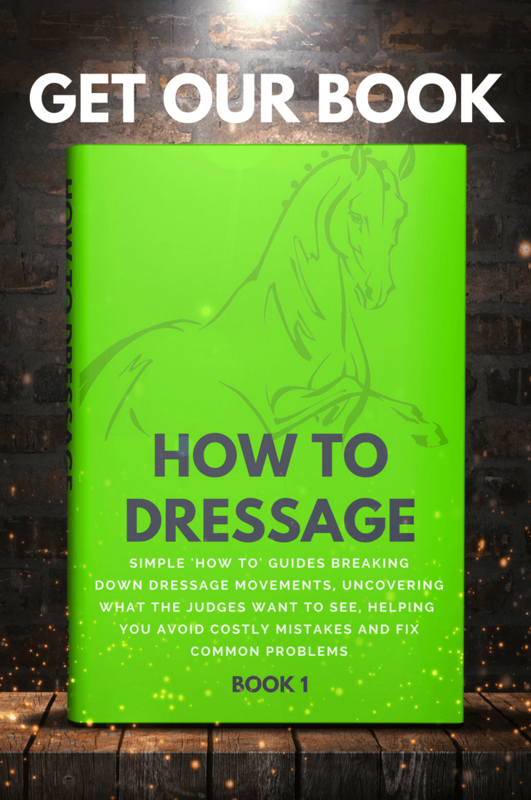 A common evasion seen by dressage judges is the horse’s quarters swinging out. That’s because it’s easier for a laterally stiff horse to escape via his quarters than to bend through his body. 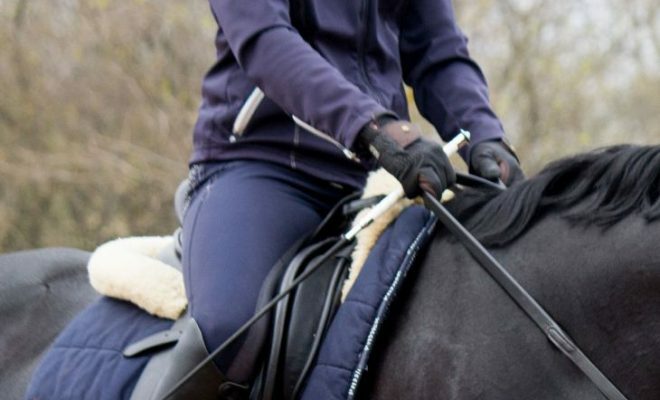 The evasion is usually possible because the rider has not opened the hip to place their weight into the inside seat bone, so their outside leg and weight are not fully effective. If you feel the horse’s quarters escaping, apply a little more pressure to the horse’s side with your outside leg, keeping your leg long and open at the hip, and ensuring that your weight is on your inside seat bone. That aid keeps the quarters following the shoulders around the line of the circle or turn, preventing the horse from moving on two or three tracks. You will also use your outside leg to position the horse’s quarters, for example when riding lateral exercises such as half-pass, travers, and pirouettes. 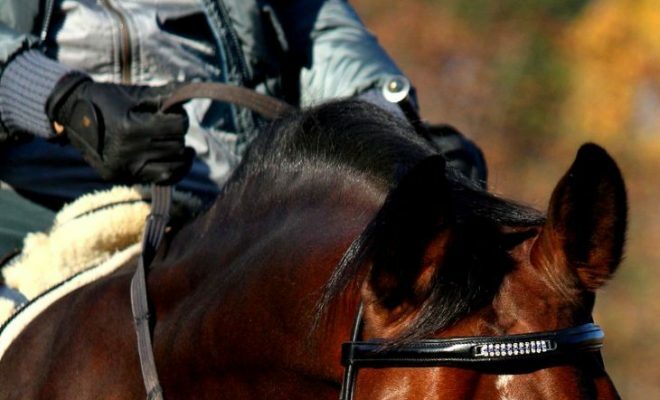 In counter-canter, your outside leg remains slightly behind the girth to tell the horse to stay on your chosen canter lead without changing legs. Your outside leg is used to control the horse’s quarters and to back-up your outside rein aid. However, the outside leg is only effective if you open out your hip and bring your whole leg back (not just bending at the knee) and allowing your weight to drop into your inside seat bone. Did this article help you to correct your outside leg position? If we gave you a lightbulb moment, tell us in the comments box below! I love your articles! I actually never gave it a thought before now about the weight shifting to the inside seat bone . I only thought about keeping the quarters from swinging out. I would love to know more about why it’s good for the horse to have to re balance more when there is more weight on the inside seat bone.